It was sobering to learn that during the entire period I'd heard from only three students. There are 29 in that class. Focusing on bouncing means taking responsibility for the amount and kinds of information I get—and most important, who I get it from. Everyone in schools is talking about data. Data systems. Data management. Data mining. In an era of accountability and high-stakes testing, we are expected to use more and more quantitative indicators. Some now talk about "big data" and how we can gather more information from students while they are being tested, using a web-based testing platform, or their smartphones to interact with testing companies' products and services. Traditional paper and pencil assessments, including online standardized tests, produce lots of data because they take large samples from the student population. These instruments also have a very broad reach and can cover vast swaths of student sub-populations, giving the appearance of equity and inclusion. It is true, as any summative assessor will tell you: standardized tests allow us to summarize trends and to establish proficiency targets for the system. Scores on benchmark assessments, the number of homework assignments completed, the letter grade earned if corrections are made to a test or quiz—these "public" numbers give us confidence that something has been measured. In the aftermath of No Child Left Behind, we learned that the data points matter to school administrators and policymakers. These summative assessors prefer "hard, objective" data over the "soft, idiosyncratic" data generated by non-standardized assessment tools and teachers. Exit slips, word webs, quick writes, so the argument goes, are no match for the multiple choice and short answer items designed by experts (Bennett 2011, 2014). We want to know who got stuck in the transition from the "I do" to the "we do" portion of the art lesson, who had trouble focusing today on the objective for the group project, and how to re-pose the guiding question so everyone can make progress. In this chapter, we introduce the concept of bouncing to increase the depth and breadth of data points available to the formative assessor. Whether we're talking hard or soft data, there are no shortcuts to sampling from a wide variety of data sources (oral, written, kinesthetic responses) during instruction. A sample of student thinking that is too small, too narrow, and not representative, helps us little in making good instructional decisions—and helps the kids even less with next steps. That's where bouncing comes in. Formative assessors know that bouncing moves aim to widen the net of observation so the teacher can get more robust data to use during instruction and the learning segment. Bouncing moves help teachers like Mirabelle and Arturo on their journeys to becoming formative assessors by teaching them to strategically sample evidence of student understanding (and not just focus on the two to three kids who always do the work in class). Bouncing puts the focus on what students say and do during class time and helps us gain access to more and better information about student thinking during the learning process. Bouncing forces us to examine our data-sampling strategies. Bouncing. What comes to mind? A ball. E-mail. A check. Tigger. Bouncing suggests movement: springing, hopping, ricocheting, rebounding, reflecting, and rallying. Bouncing implies energy, enthusiasm, dynamism, liveliness. Such bouncing does indeed happen in classrooms. But the kind of bouncing formative assessors mean is bouncing that facilitates sampling student thinking. Definitions and connotations of bounce can help us with key and nuanced concepts related to bouncing in the classroom learning space. Doing a Google search on bounce reminds us that in many contexts, "bounce" is "exuberant self-confidence," as in, "the bounce was back in Jenny's step." Synonyms: vitality, vigor, verve. We certainly do want our students excited about learning, as educational psychologists who study motivation will tell us. The combinations of potential bouncing moves are also worth considering in this chapter. Person to person, idea to idea, fact to fact, machine to person, person to machine—our goal is to widen the sample of student responses with all permutations of bouncing. Why? To gather evidence in order to make an instructional decision that advances student learning during the lesson. As formative assessors who bounce questions on the fly, we want to know: Can we stop here? Is it time to check for understanding? Should we move on to the next activity? How many of us have grasped the objective? Who needs help making the leap? Other synonyms that Google lists for bounce—rebound, spring back, ricochet, jounce, carom, and reflect—suggest the motion, challenges, and complexities inherent in the bouncing action of whatever it is that bounces off, bounces back, or bounces around our classroom learning space. Let's explore some of the features of bouncing knowing that it is a move that requires patience, practice, and a new approach to speaking and listening to our students. Bouncing moves aim to intentionally and systematically sample a variety of student responses to better map the terrain of student thinking, understanding, and performance in a class. The goal of sampling—with the aid of bouncing moves—is to help teachers make sound instructional decisions grounded in the best evidence they can gather during instruction. Bouncing moves increase student engagement and bring more voices into the classroom learning environment. Bouncing commonly happens via a call-and-response routine. During whole class instruction we see the teacher posing a question to the whole class. As the question hangs in the air, the teacher typically selects who gets to answer. Students with their hands in the air—or who aren't paying attention—often get called on first. How students get called on—whether randomly, by recognizing the first hand in the air, or by choosing a student who hasn't participated in a while—matters when bouncing. How many students are called on matters when bouncing. Which students get called on—is there a pattern of calling on only the most talkative students?—matters when bouncing. A more productive alternative to a typical call-and-response routine is the bouncing move "Call and Pivot." With "call and pivot" bouncing moves, teachers purposefully circulate around the classroom—from group to group, individual to individual. By bouncing themselves around the room, teachers can widen the net of observation, making more student thinking visible. Learning to listen in as students talk and work in groups, a formative assessor can gather valuable information about the depth and breadth of student approaches to an activity or task. Sometimes the teacher poses a key question to the whole class, invites students to pair and share in response, and then strategically moves about the room, bouncing herself from pair to pair, listening in, and drawing conclusions about the level of understanding. In this example, bouncing helps us move beyond the appearance of learning; it focuses attention on who is stuck, who is moving along with assistance, and who can work independently during the lesson. Moreover, when connected to other moves, bouncing is a major time-saver. It guides the teacher's strategy for checking for understanding by providing a plan. The teacher, who has mastered bouncing in group work settings can usually listen to—and perhaps prime, probe, and prime again—more than half her class's first-draft thinking in a short time, and do so before she redirects attention to the assignment and deliverable for the day. We maintain that bouncing is a prerequisite for checking for students' prior knowledge and for delivering on the promise of checking for understanding, day in and day out. Call. Pivot. Walk and Bounce—this is a new routine worth trying out. If we see bouncing through a sage-on-the-stage paradigm of pedagogy, the teacher is the center of attention. The sage shines the spotlight, the student responds. Sage comments, then bounces the spotlight to another student. In the best of circumstances, the teacher bounces the spotlight to several students, attempting to collect a range of student responses with which to make well-informed instructional decisions. In the worst case, the light shines on a few and no one sees a thing. It's time to put forward a new paradigm of pedagogy—the guide on the side. Why Bounce? For Whose Good? For What Good? Some definitions of classroom assessment focus on getting hard quantitative results to teachers, parents, or administrators. The prevailing logic seems to be that the quicker the cycle of eliciting student responses—and turning them into numbers, graphs, and charts—and reporting this data happens, the better the formative assessment information will be to support "data-driven" decision making. We concede that quantitative results (what appear to us as scores, points, numbers) are necessary in the school system. The question is if those results are sufficiently robust for teachers who need just-in-time qualitative information about student learning as it unfolds in the classroom. Teachers have a different mandate and set of questions that drive their interests in data. We rightly ask: How does the summative data inform the difficult choices we make as teachers in a particular lesson segment or transition? How does the numeric score inform pedagogical choices such as where to provide specific feedback, to whom, where, and when? What does a percentile or proficiency rating tell me about what to reteach, when to scaffold academic language, or how to coach, for example, a language learner through being "stuck" with a big idea or intricate procedure? To get answers to these questions, formative assessors need to refocus on moves that make student thinking visible in real time at grain sizes that are meaningful to teachers. Bouncing moves can help us to gather more instructionally sensitive, soft data about student learning as it unfolds during class. Teachers want data that can help us make sound inferences and wise instructional choices on the fly. We want data not just about individual students' thinking and performance—but about group dynamics and school climate that influences our daily lessons. We want data that is representative of each period and each group of students—helping us make connections, see patterns, and be more effective in the next lesson. No matter how someone labels or markets or packages up the term "data," the formative assessor is most interested in samples that help us differentiate instruction and provide better feedback during a lesson. This takes learning to make bouncing moves—many of them, in all sorts of new and different ways. Maxim: All else being equal, the better we sample a set of student responses by bouncing strategically and consistently, the better chance we have of getting a representative and more reliable picture of student thinking on the day's lesson topic. So far, we have established that formative assessors are intentional in their classroom assessment designs. Borrowing a few principles from a panel of educational assessment experts at the National Research Council (2001), we have agreed that the logic of formative assessment is not that different from other approaches to assessing student learning. The assessment triangle is our guide too. First, we identify what is worth assessing. We prepare a clear, well-defined set of learning targets to guide our lesson and unit plans. We care about how students learn and which Habits of Mind they bring to bear on authentic learning tasks, problems, and projects in our classrooms. The first vertex—student cognition/learning—is (and must be) the foundation of all formative assessment practice. Next, we pair those learning targets and ideas about how students learn with a host of observational strategies, each aimed at gathering evidence of learning. We pose questions, then pause, and probe to elicit, coax, and make the current level of student understandings more visible to all. We set up clear, agreed-upon routines and practices that students come to see as normal, embedded assessments that support both instruction and learning. Our range of questions, prompts, and activities, aligned with specific instructional and curricular goals, are part of the FA toolkit. We purposely scaffold and tailor these routines and practices to maximize opportunities to meet students in their particular zones of proximal development. We now turn to bouncing (which is also connected to tagging and binning) moves that serve the interpretation strategies/modalities vertex in the NRC's Assessment Triangle. Whether pulling equity sticks, using a randomizer app, or plain cold calling, bouncing demands that we sample the classroom learning space. To locate misconceptions, to uncover prior knowledge, to identify differences in the current level of understanding—we must widen the response net—and recognize when we have not. To make a reliable and valid interpretation of where student understanding is and where they need to go to next, we must have systematically sampled. Bouncing moves allow the formative assessor to modify sampling strategies, take stock of the limitations of any given inference about students' abilities and skills, and most important, check what the evidence allows us to say or do with our soft data. As with all other moves in this book, our goal is to be purposeful, intentional, and aware of the pitfalls that come from being too hasty and rushing to judgment. The key idea in the next chapters is learning how to interpret and validate the data you have on student learning, and when necessary, to return for more. Formative assessors are bound by a covenant that places a priority on eliciting student responses that help them gauge learners' current levels of understanding and their need for support in the actual moment of classroom instruction. Skillful bouncing is needed to make this happen. The testing event is a snapshot, helpful for doing autopsies. Bouncing, on the contrary, works in the living classroom where the action is live. Systematic, intentional bouncing in the classroom learning space helps us answer these questions: Which students have shared with the class and which ones haven't yet? What are the major misconceptions and procedural errors in play during this activity? How representative is this particular student response for the class as a whole? Am I dealing with an anomaly or a trend in student thinking with Alice's response? Those becoming formative assessors need to be clear about how their bouncing moves link together with the other two major moves, tagging and binning. Each of these aspects of the interpretation vertex of the assessment triangle (Figure 5.1) will require planning, coordination, and practice. We can't skirt the facts on the ground: if our bouncing moves do not lead to better tagging and binning procedures and protocols, then our instructional decision making about what to do next will be compromised. No need to worry, though. We will explore a few basic bouncing moves (e.g., equity sticks, gallery walk, pass the stuffed animal) to improve our chances of landing on representative samples of student thinking, one lesson at a time. But first, we delve into what the experts tell us. Educational research tells us surprisingly little about the mental models teachers use to determine which students to approach, call on, or not call on. The research focus on asking good questions, using wait time, and probing for more in-depth explanations has come at the expense, it seems, of explorations into teachers' understanding and use of sampling strategies. We do know that teachers' bouncing practices vary. Some seem to effortlessly increase the student response space and sample from it well. Others struggle. Experience, skill, depth of content knowledge (Carlsen, 2015), and disposition likely play roles in explaining why there is so much variation in bouncing techniques. Misconceptions (e.g., cold calling yields insight into most students' thinking) and p-prims (e.g., cold calling gets the ball rolling) may too. Recall that a p-prim, an intuitive idea stemming from our experience, is more like a preconception than a misconception—we all have them. Cognitive demands on teachers are high as they work out who, when, and which on the fly questions will drive their lessons. Cognitive load theory (which we explored in Chapter 3 on Pausing) suggests that the working memory of teachers and students is likely to be limited in capacity and duration. As teachers launch, orchestrate, monitor, and adjust a lesson, they will need processing time to make sense of the current levels of student understanding that they are witnessing to guide their next instructional moves. When it comes to bouncing, tech assists including clickers and vote counting apps may help to reduce extraneous cognitive load. Usually, however, these devices do little to aid in uncovering students' higher-order thinking or support requests for further elaboration and sense making (Hunsu, Adesope, & Baylyn, 2016; Kay & LeSage, 2009). Too often, these tech devices artificially constrain the response options (with predetermined "choices"). They may also promote the illusion of strategic sampling of student responses by relying upon a random default settings. As we shall discuss, random sampling is not always better or more useful to the teacher interested in equity and diversity. For students, these tech assists look like another form of multiple choice testing. For teachers, knowing who voted for which answer does not tell us much about why they voted this way. No technology magically provides the cognitive, affective, and social-cultural sense making required for teachers to know what to do or say next when students are stuck. And for formative assessors to "sense make" in diverse classrooms, they need evidence—beyond polling for opinions by clicking a button. Students need to speak, verbally process, and elaborate on initial drafts of ideas in the classroom. Wollman-Bonilla (1991) found that ability grouping affected the length and quality of students' contributions to discussions. Hemphill (1986) noted that girls from middle-class and working-class families use conversational overlap differently: either to make a bid to speak, or to show support for the speaker. Although these studies are insightful, we found little research that unpacked how bouncing to these different groups of students affected the quality and quantity of assessment-rich information that teachers might use. We were surprised to learn that some research argues for cold-calling, a novice move in our eyes. The act of calling on students who do not volunteer is common. Dallimore and colleagues (2012) found that in classes with high cold-calling rates, significantly more students answer questions voluntarily, and the number of students voluntarily answering questions increases over time. Further, they found that in classes with a culture of high cold-calling, students' comfort with participating in class discussions increases; in classes with low cold-calling, students' comfort with participating does not change. Although their research findings show that "cold-calling can be done fairly extensively without making students uncomfortable" (p. 305), we leave it to you to decide to what extent these findings might be applicable to your kids, context, and curriculum. You might start by asking: how much do I get out of situations where someone cold calls on me and I am "volun-told"? Research on typical bouncing strategies shows that they may not be warranted or in the best interests of the community learning. Take one example of the most common discourse pattern in classrooms, the Initiate/Respond/Evaluate (IRE) routine. Wells (1993) has documented that 70 percent of all discourse in secondary classrooms follows this routine. The teacher "Initiates" a question, a single student "Responds," and the teacher immediately gives a verbal "Evaluation" to that response (Mehan, 1979; Wells, 1993). In the next chapters we explore better options for uncovering student thinking for those learning to become formative assessors. More recent educational research in this domain has focused on teachers' elicitation practices—actions teachers take during class to elicit evidence of students' knowledge and understanding—and "teacher responsiveness." Pierson (2008) has conceptualized "teacher responsiveness" as the extent to which teachers focus on student ideas in moment-to-moment interactions. Implicit in such observations is the notion of bouncing. Pierson analyzed teacher talk and categorized teacher responsiveness as "low" or belonging to either of two categories of "high." The two categories of "high responsiveness" were distinguished by teachers' main purpose in responding: either to identify students' ideas with the intention of correcting them (High I responsiveness) or to understand students' reasoning on its own terms (High II responsiveness). Low-level teacher responsiveness, on the other hand, was characterized by teacher responses that exhibited limited connection to students' thinking. As teacher educators interested in development and learning trajectories in formative assessment, we recognize that not every "productive," "responsive," or "high level" move by a teacher (however coded by researchers) will be fully captured in analysis of teacher-student talk. We maintain that researchers and practitioners agree on the importance of teachers being able to incorporate elements of students' ideas and reasoning skillfully into their oral responses to students and that scarcely little research has thoroughly explored how teachers develop these skills—from preservice to induction or beyond. An exception is the work of Jacobs, Lamb, and Philipp (2010) in the area of elementary mathematics instruction. Jacobs and associates' study involved teachers who had participated in a professional development endeavor that extended beyond four years, which also contributes to the noteworthiness of their longitudinal research. They found that teachers do not routinely begin their careers with expertise in attending to children's mathematical solution strategies, interpreting children's mathematical understanding, or deciding how to respond. Teachers begin developing expertise in the first two of these three skills through teaching experience. Typically teachers get better at attending first, then they begin to improve at interpreting second. Jacobs, Lamb, and Philipp also found that teaching experience does not correlate with expertise in deciding how to respond on the basis of children's understandings. That is, just having taught longer does not necessarily mean that teachers know better how to respond to children in the moment, nor know what "next steps" are likely to help advance children's learning. Not surprisingly, Jacobs's team found that professional development that supported teachers' attending, interpreting, and deciding how to respond to children's oral or written mathematical strategy explanations did seem to positively influence teachers in developing expertise in all three skills. Their research has provided the most "nuanced story" of the development of teacher expertise in "professional noticing" of children's mathematical thinking—by attending to, interpreting, and deciding how to respond—to date (p. 192). Important as this research is, it does not address a critical aspect of bouncing moves, or the broader problem of sampling (error, bias, and fairness) raised later in this chapter. Ateh (2015) conducted a study that analyzed two high school science teachers' elicitation practices over the course of an academic year. She specifically chose the two teachers from the participant pool of a larger, ongoing study of science teachers at 10 comprehensive high schools in Northern California because both teachers had stated, while watching video of their own teaching, that they had "used elicited evidence of students' knowledge to make instructional decisions that enhanced students' learning" (p. 118)—examples of "substantive" formative assessment practice according to Coffey, Hammer, Levin, and Grant (2011). But Ateh found a "mismatch" between their perspectives of their formative assessment practice and her analysis of what transpired between the teachers and students in class. Ateh found that, too often, these teachers' elicitation practices were "characteristic of low-level elicitation" (p. 112). Educational researchers continue to document a hard, generally "known" and accepted truth: effective, "substantial" in-class formative assessment is needed, difficult to do, and still relatively rare in many K–12 classrooms. That doesn't mean there aren't models of good teaching to learn from in experts' classrooms. Dr. Deborah Loewenberg Ball is widely known for teaching—and her self-study of her own experiences of teaching mathematics with 3rd grade students—in ways that reflected close attention and responsiveness to their thinking. Ball (1993) did not call what she or her students were doing in class "formative assessment" nor did she consciously enact "bouncing" (the concept and term had not yet been conceptualized nor articulated yet). However, a closer examination of her oft-cited article, "With an Eye on the Mathematical Horizon: Dilemmas of Teaching Elementary School Mathematics," published in The Elementary School Journal in 1993, through the lens of the FA moves framework presented here gives us insight into the complexities of teachers' decision making regarding bouncing. Sometimes my problem is that it is very difficult to figure out what some students know or believe—either because they cannot put into words what they are thinking or because I cannot track what they are saying. And sometimes, as in this example [the now-famous "Sean numbers" example; "Sean numbers" are numbers that, according to Sean, were both even and odd], students present ideas that are very different from standard mathematics …. Although Sean was, in a conventional sense, wrong—that is, six is not both even and odd—his claim was magnificently at the heart of "doing mathematics" (pp. 387–388). Ball's focus was not explicitly on the percentage of students who were reached by her "bouncing" strategies. But we see them as having played a key role in orchestrating and uncovering student thinking during the class discussion about "Sean numbers." (The class named numbers made of odd numbers of "twos" after Sean in their next mathematics lesson.) Ball did, however, "aim to develop each individual child's mathematical power through the use of the group" (p. 388). By our back-of-the-envelope analysis of Ball's report of the day when as class began "Sean announced that he had been thinking that six could be both odd and even because it was made of 'three twos,'" 32 percent of her students (7 out of 22 students in her class that year) either came to the board and questioned or explained or vocally weighed in during the first "Sean numbers" conversation (pp. 385–387). Without calling it bouncing, we suspect that Ball thought deeply about "ways to construct classroom discourse such that the students learn to rely on themselves and on mathematical argument for making mathematical sense" (p. 388). We argue that bouncing as a concept—and an accessible practice—can play an influential role in helping make that happen and that Ball's research bears our hypotheses out. Deborah Ball and other expert teachers using "bouncing" techniques are operating at a level well beyond the bouncing moves we typically see novices enact in mathematics classrooms. As an expert teacher, she demonstrates a disposition toward inquiry and self-examination. As a formative assessor who anticipated the power of not merely checking for understanding but exploring student schema and p-prims, Dr. Ball's work deserves our attention. We favor approaches that increase the student response sample taken by setting up visible procedures that take advantage of random selection. Bouncing smarter means sampling on students without intentionally raising affective filters or promoting cognitive overload. There are immediate implications for our advice (alert: we may be challenging your sage-on-the-stage comfort zone). We say, as gently as we can, no more teachers "pouncing" on students who aren't volunteering. No deploying "tough" questions as a classroom-management technique. Let's refrain from using pouncing strategies—like A.A. Milne's exuberant Tigger—to catch students who are misbehaving or not paying attention. Instead, we favor making your bouncing routines visible, sharing them with your students, and reaching agreements on how to increase the circles of participation. Sampling student thinking strategically means employing moves that feel more systematic and less arbitrary, less "gotcha" and more invitational to all. We note that strategic, intentional bouncing moves will maximize the purposeful selection and recruitment of volunteers while potentially attending to populations of kids that tend to be undersampled in too many classrooms today. There are many ways to identify these students in your classroom. Educational psychologists typically bin them into categories such as "quiet," "shy," and "introverted" and leave it to teachers as to how to actually approach "them." Students with IEPs, those from different racial or ethnic backgrounds, or those with language proficiency struggles (what summative assessors call "sub-groups") may need us to bounce more purposefully to support their needs. But let's not fall into the "us" and "them" labeling trap: "We" are in this together and we bounce purposefully and with compassion because it helps us all to know where we are and where we want to go next in the classroom. When asked what one should do to help a child that is quiet, the most frequent suggestion of the teachers with whom I have worked is to give [quiet students] more speaking experiences. While this approach may be helpful to some people, it is very likely to be harmful to most. Not all quiet children are alike. No wonder teachers return to calling on the eager beavers! The pull of feeling like a successful teacher whose students know the correct answers is strong. Sampling silent Sallies and Bobs, who may be stuck or falter—especially when we are being observed and evaluated—is a dangerous move in the eyes of beginning teachers trying to look good. To complicate matters, researchers and formative assessment experts don't give us much guidance. We ask: And what about bouncing to the cynical Sams or angry Andrews in 6th period? How am I supposed to sample 75 students on track and field? Why should I take the time to have all my students tag their responses to the wall when I can just hand out a quiz and "bounce" to all 37?! We agree. Good questions. It's enough to make us want to throw up our hands, too. It can take so much energy to just think about it—and more to actually bounce well. Some teachers use extrinsic rewards (e.g., tokens or stickers) to increase participation and put a bounce into the classroom learning environment. Boniecki and Moore (2003) found that the amount of directed and nondirected student participation increased while a "token economy" of extrinsic rewards for participation was in place and returned to baseline after removal of the token economy. It is difficult to tease out the causes and long-term effects of these sorts of positive reinforcement regimes. But most agree that various bouncing strategies influence students' behavior differently. Armendariz and Umbreit (1999) found that students' disruptive behavior decreased dramatically when response cards were used and increased again when conventional hand raising was reinstated. One thing is clear: the "business as usual" approach to sampling student responses is not working for "underachieving students, whether male or female" (Myhill, 2002, 2006). Finn and Cox (1992) found that students who are not active participants in classrooms are at greater risk for dropping out of school. Common sense tells us that being invisible, sitting in the back of the room, having the teacher pass us by each day because we take too long to say what we think is going to have an effect. The case for bouncing to increase students' active participation while building up a better picture of the current levels of our students' understanding during the lesson is strong on its own merits. Let's now explore the problems, issues, and orientations necessary for smarter bouncing. We agree that increasing students' active participation in classes is a critical feature of democratic education. Bouncing helps students find their voices in our classrooms, but the bouncing moves outlined in this book need to be about more than "just" engaging students. The sampling aspect of bouncing, which underpins the interpretation vertex in the assessment triangle, is of core importance to teachers who are learning to become formative assessors, and thus make better instructional decisions based on sound classroom assessment evidence. think about and act wisely on the limits of inferences made from on-the-fly observations. First, let's talk about the role of sample bias in the classroom learning space. Intuitively we know that sample bias happens. When an organization conducts a survey of public opinion, let's say on predicting U.S. election results, but only uses one social networking site such as Twitter to do so, clearly the range of responses depends on who has an account with the company. Though Twitter accounts are certainly popular and are widespread in the United States, the "American public" in this survey sample is not well represented, in part, because the survey is restricted to account holders. Now let's pretend the organization, after conducting its survey of Twitter account holders, says "According to our exhaustive survey, the people in the United States believe that …" or "Overwhelmingly, we found that U.S. citizens favor …" or "People in the United States feel …." Would you trust these statements? Would you agree with the sampling methodology? Would you wonder—even just a little—how the polling organization controlled for bias before reporting their results? It turns out that sampling bias happens in the classroom learning space, too. We may sample the prior knowledge of only students who raise their hands, a parallel to the Twitter users example above. We may sample only students who respond to our questions nearly immediately. (Even if we have the intention to check back in with students who need more time to respond, we don't always.) Perhaps, while circulating during group work time, we may sample only students whose nonverbal body language communicates to us, "I'm open to conversation right now." I've found that bouncing can be the easiest formative assessment move as well as the hardest. It can be the easiest if the classroom is primed right. Students have to know what procedures to expect. Students need to understand we really are going to ask questions of everyone. Bouncing in a class that is not primed brings lots of blank stares. Wait time with bouncing gets into the hardest part of bouncing. During wait time, I used to get students pointing out that other students were ready. "Call on them." So many students are used to sitting in class without being called on. They've been able to wait teachers out. Some students, it seems, will do anything to not talk in class. Bouncing is a culture you have to build in class. And if you don't do it right, it's like pulling teeth and taking prisoners. How aware are we of the different types of classroom sample bias? We know from experience that it is easier to call on students who volunteer, are verbally facile, are extroverts, communicate interest in the topic, respond quickly, give responses that are easy to understand, ask questions, or emanate positive energy. These characteristics describe the eager beavers in our classrooms, those kids who make it easy to create and sustain feedback loops. No wonder sample bias often skews toward these kids' experience of the lesson! Formative assessors, however, need samples that are more representative of their entire classroom population. Checking in with only the "Twitter users" will influence the inferences we can soundly make about the whole class. Instructional decisions based only on responses from those students with accounts do not have the opportunity to be as robust as instructional decisions that are based upon more representative samples. So, what's a formative assessor to do? One answer: try the stratified random sampling approach. As formative assessors, we need a wide and diverse range of student responses. We can carry out bouncing strategies that aim to get us a more "representative" representative sample. How? By identifying which students, by groupings, need to be a part of our sampling design. In a modified stratified random sample response design, the teacher checks for understanding with a sharper focus on students from particular populations such as English language learners (ELLs), special education (SPED), or accelerated (GATE). For example, she might have a few cups to store the equity sticks in different groupings/configurations. Each day, depending on her purposes and her choice of focus students, the teacher pulls names at random from the different intentionally configured cups. There are no predetermined limits on which groups the teacher chooses to sample or which techniques for sorting and calling she uses in her classroom. The point is to gather data or responses, from each of these cups. With this more representative sample, based on differentiated student needs, teachers can make instructional decisions grounded in smarter data. What might the different cups or buckets be—beside the familiar ones based on well-known categories? That's your decision. Maybe you want to start with just one of your classes for a particular unit? Or maybe with the shy students? Or students taking the class for a second time or struggling with different modalities of verbal communication? Gathering responses from one or two stratified buckets is probably better than having a one-size-fits-all approach to bouncing, but each teacher has to make a move that regularly gets them student response data from all the buckets they deem important for a particular unit and class. Summative assessors who work in the standardized testing world know that measurement error happens. When we use score data, the evaluation of any student's true ability, skill, and capacity is always compromised. Testing experts use the concept of reliability to express the degree of uncertainty about the dependability of these observed scores. We teachers do the same every time we question: Is this really Juan's best performance? Are we getting an accurate indication of what he really knows and can do? Did Jackie's mood, energy, lack of sleep, and missed breakfast interfere with her best efforts on the test this morning? Was Bikram's first draft on the lab really his best work? As well-intentioned as we are, whether as professional test makers or classroom assessors, we will miss data points that fill out a picture of true ability and skill level—whether it's a picture of an individual's performance or of the entire class's. All sets of observations—standardized or not—will contain a degree of measurement error, which leads to a degree of mischaracterization about our students. To complicate matters, the questions, prompts, and tasks we use to assess our students can succeed and fail for reasons having little to do with students themselves. Poorly written questions, confusing instructions, and language laden with cultural and linguistic assumptions can push us into the shadows from what we truly hope to evaluate in the classroom. Too many classroom assessors hide behind those shadows, perpetuating the myth of the accurate score, the reliable GPA calculator, and other so-called objective grading practices (Guskey, 2002; Winger, 2005). Most of us try to construct fair tests, reasonable homework assignments, and unbiased questions and tasks for class activities; however, measurement error still happens. Our points, check marks, and grades are an attempt to approximate the true score assigned to each and every student; we presume these numbers represent the actual level of student understanding. But we never know the true score. Ask any expert. Formative assessors, like summative assessors, must admit that our judgments about students' current level of understanding are at best provisional. Sometimes we have a degree of confidence about those true scores, other times not so much. Cold calling seems to work. It's a pattern we know and see all the time in classrooms. Despite the potential pitfalls with this bouncing move, we notice that most teachers (beginning and experienced) use the question-as-flashlight approach to shine light on the eager beavers, and to wrestle control back from the lesson "haters." Cold calling and other teacher-directed bouncing techniques seem to satisfy a need to dominate the classroom learning space. Before getting ahead of the how-to-sample-better story, let's examine the traditional Q&A model more closely and explore a few of its problematic characteristics. First, many teachers are in the habit of making participation in their classrooms voluntary. Only a small group of students deeply and actively participate, soaking up the offerings of the learning environment in the process. This results in two significant problems: the teacher's evidence base for decision making is much smaller than it could be; and there are many other kids who could be engaged more directly but become invisible as the lesson proceeds. The majority of student ideas and beliefs recedes as volunteers take up more and more space in classroom discussion. You are probably familiar with the sobering implications of this imbalance of student engagement. Others have referred to it as the multiplier, or Matthew Effect (Gladwell, 2008). The deeper, more direct engagement of a few kids often leads to their greater success as compared to their quieter, less engaged classmates. This comparative success—and attention from the teacher—leads to greater effort (often from both the teacher and those students), which leads to still greater success—a small reinforcing feedback loop that could, with some changes, include many more students. Second, even when student participation is not voluntary, but proceeds in a random fashion, a few good eager beavers can still soak up the action. Now, it is the randomizer app that cold calls on students. In this traditional Q&A model teachers still tend to elicit responses only from a few students. Hence, these technologies consistently misrepresent the full range of student thinking on a topic. This means, inevitably, that teachers miss out on finding misconceptions or digging deeper into preconceptions. You have probably experienced what's problematic about not uncovering misconceptions or procedural errors or firmly held opinions early in a unit. Failing to bounce out the gate, to sample across the classroom, to "pass the stuffed monkey" to more than 10 percent of the class means that students' thinking goes undetected—for hours, days, or even weeks. Before you know it, lots of students are failing quizzes and unit tests. You are handing out zeros and Fs. Now becoming a formative assessor takes on a whole new meaning. Bouncing is a new habit that breaks up old cycles and brings about opportunities for early intervention. Good Intentions Are Not Enough, Nor Is the Quest for the "One Best Answer"
The third problem with the traditional Q&A model for sampling is too often the result of good intentions. In an effort to connect with students and lead them toward a learning target, the back-and-forth among the teacher and students frequently takes on a "guess what's on the teacher's mind" quality. If not an outright guessing game—which we have observed many times and have played on occasion in our own classrooms—then at least a situation where the teacher is working for a predetermined response. A response. One. Not the wide range of responses formative assessors need in order to make valid, sound inferences on the current levels of understanding to meet students where they are. Becoming a formative assessor means becoming aware of when this search for the one best correct response is happening, having other bouncing options at your disposal, and trying out routines that improve your sampling odds. Improving bouncing moves requires self-regulation and a metacognitive stance toward your teaching practice. A professional development conversation with your colleagues about how and why teachers sample the classroom (for whose good and for what good) could make student thinking more visible in your classroom and school. Earlier we gave the example of a physics unit focused on buoyancy and specifically the question, "Why do things sink and float?" Research on misconceptions about buoyancy (Yin, Tomita, Shavelson, 2008) reveals that students typically think that big, heavy things sink and small, light things float; that hollow things float; and that sharp edges make things sink. Similar work on facets of understanding in physics (Minstrell, 1992, 2000) have been worked out, as have new breakthroughs on student learning progressions in math (Clements & Sarama, 2014; Lehrer & Kim, 2009). These findings can guide our choice of observational strategies, but we must still attend to the mode of interpretation based on good samples of student thinking. If we know that major misconceptions related to concepts of mass, volume, and density exist for this topic, but we constrain our sampling to only one or two students' responses, we may miss the opportunity to surface these beliefs and hence address these misconceptions across the classroom. Bouncing well matters. To make good instructional decisions for students on the fly, teachers need good information on the current level of understanding of the group. So after asking students why some things float and others sink, the teacher needs to bounce the question across the room to pick up more responses. She can widen the net by probing and bouncing: "So who thinks things float because they're hollow? Can you say why? Take two minutes to explain what you think to your table partner and then write down two to three sentences explaining why. We will share these responses out on the document camera to look for patterns." Mastering FA moves allows us to go deeper and wider with samples of student thinking at the same time. We think that a mix of lesson openers, quick writes, and exit slips can move the formative assessor toward more evidence-based decision making in the classroom. But first, we will need to think through our bouncing moves to employ sampling strategies that help to form a clearer, more reliable picture of what most students know and can do. Assessment for learning demands no less. We argued in Chapter 2 on Posing and Chapter 4 on Probing that formative assessors are in the habit of planning, enacting, and reflecting on the questions, tasks, and prompts they use to elicit student thinking. Unless you are the undisputed expert in your field and able to retrieve questions and size up every student's needs on the spot, however, we suggest taking the unheroic route by preparing a few questions in advance of lessons. Questions that are planned in advance of the unit, that are aligned with visible learning targets in the Cognition vertex of the assessment triangle, and that spiral back throughout the semester are most likely to help your students learn to use their minds well. Planning for bouncing, as for posing and probing, can also help prevent mishaps that result from teachers' well-intentioned, often improvised efforts to engage students. Students, like most humans, do not like to experience learning in the form of surprise attacks, swarming probes, and inchoate, seemingly random queries that demand an immediate answer. When we skip the planning phase, our bouncing quickly descends into pouncing, and the students know it. For those committed to mastering formative assessment moves, priming for bouncing requires us to plan lessons that anticipate where particular groups of students will likely fall down and when particular individuals are likely to freeze up as we bounce questions and thoughts around the classroom. I started out strong. I started using equity sticks for my bouncing for the first few weeks. But as the semester progressed, I got lazy with continuing to train myself to use equity sticks every time. Pretty soon, once-in-a-while turned into never. I've renewed my commitment to using equity sticks to bounce even though the kids groan when I take them out. I think it's because they know there is actually a chance they will be called on. Too bad. I think they're getting used to it. But even if we get stuck—or I forget—I don't want to stop with the equity sticks. I know to bin well, a teacher needs to bounce well. For me, using equity sticks is key to bouncing better. Let's be honest. Even when we try to sample around the classroom, in the theater, in the gym, or on the field, our capacity to capture, record, and study even most, if not all, student responses is limited. Too little student thinking is made visible by the idiosyncratic and inconsistent nature of our sampling strategies. Despite our good intentions, we may be searching in the dark for clues about our students' abilities, skills, and capacities. On-the-fly observations suddenly don't seem so cool, fair, or useful. Going deeper and getting smarter with bouncing requires recognizing—and working productively with—the limits of the inferences we can draw from our on-the-fly observations. FA Fact: Poor sampling leads to poor inferences. We can't know what's next if we haven't figured out the current level of understanding. How can we make valid or reliable inferences about Javone's current level of understanding when we spent 55 minutes talking to Hannah, Alexis, and Noah? How can formative assessment be formative when it fails to obtain a sample of what the kids are thinking about a topic through a class brainstorm or word web that checks for prior knowledge? How can we claim the student response space has been represented without being explicit—and intentional—about our strategies, procedures, and checks for who shared and who didn't? There is an old adage in educational measurement circles, "Garbage in, garbage out." Is poor sampling on student responses any different? Not for the formative assessor. To make these points a little clearer, let's put two sampling strategies and stances toward bouncing into sharper relief. The one stance is depicted by the Q&A bouncer who mostly uses pouncing techniques to get it done and tends to move on after a few correct answers are supplied. The other stance is the FA bouncer who is working on new moves, and different configurations for sampling a wider response space to better understand student thinking. Figure 5.2 helps us imagine these two types of assessment stances in action. Only "voluntary" participation ➞ too few students engaged and sampling feels like targeting and "gotcha" ➞ most are "volun-tolds"
Mixes voluntary and random participation ➞ lots of students engaged ➞ if involuntary, primes for "pass" or "lifeline"
The question for all of us on the formative assessment pathway is which type of bouncers are we—on our best days, worst days, and the ones in between? We will freely admit to switching stances ourselves. Somedays, it just feels easier to play the Q&A role and say to the class "get it done." Bouncing is integral to tagging; both moves can lead to more valid and reliable binning (we will get to tagging and binning moves soon). So if we fail to bounce, we actually reduce the sample space of student responses, which reduces the tagged response data available for interpretation. With this "restriction of range" (i.e., number of student responses heard, seen, read), our binning strategies become compromised. It's hard to interpret misconceptions when you haven't detected them. It's difficult to talk about students' prior knowledge and experience with a big idea or conceptually difficult material if you have not yet sampled it. Put another way: we can't make good instructional decisions or figure out our next steps in the lesson when we don't have credible soft data. Working on your bouncing moves can go a long way toward making your students' thinking visible enough to learn from it. Let's learn to pass the ball. By visualizing our classroom questioning strategies as a basketball court, maybe we can better see the need to bounce the ball from player to player. No one likes it when someone hogs the ball and fails to bounce it around the court, mostly because it rarely leads to a win. A few superstars on any team are welcome. But a good basketball game, like successful classroom teaching and learning environments, depends on teamwork. Each player has a role in bringing the game to life. The ball must bounce around the court—lots of times, to many players—before we identify the winners. Formative assessment, like a good basketball game, is not just about racking up points or celebrating the number of slam dunks in a classroom time period. It's about the movement of the ball (good questions, rich tasks, smart probes) across the room to better coordinate learning for all. Beginning teachers often pounce on the first hand raised in response to their questions. It is exciting to see that you can command and control the audience with a query. "You mean they will answer my questions if I just ask them?!" It's a powerful feeling. Teachers crave attention. We like having a captive audience. It feels good that someone "got it." Many novice formative assessors are initially content to experience the Q&A routine with a few eager beavers. The eager beavers are fun and usually cannot wait to participate. They are willing to risk a public response. They gladly supply a raised hand or excitedly blurt out an answer. They keep the ball moving, pass it back to the teacher, and give us the impression that "we got game." Teachers who work to elicit the correct answer from their students seem to have an unbreakable bond with the few willing students who have that answer. Too often, the symbiotic relationship leads to a false sense of feedback. When asked after a lesson, "So who seems to understand the objective of the lesson?" beginning teachers typically recall the answers that the hardworking, engaged students supplied. Beginning and experienced teachers who are on the formative assessment journey need ways to broaden the circle of inquiry. We offer tips and procedures, of course, but let's refocus on why we bounce. The most important reason is to increase your sample size. Formative assessors can use equity sticks, index cards, or other tools to generate responses from individuals and groups throughout the classroom. Those who are learning to become formative assessors can make notations on a seating chart to widen the net and keep track of patterns of participation. By increasing the breadth and depth of student responses, the teacher is better able to draw meaningful conclusions about the current levels of student understanding, including the bottlenecks, pit stops, and places we all get stuck. Without consistent procedures and visible practices related to bouncing, or spreading questions throughout the classroom, there's not enough evidence that the majority of students in a class have actually engaged in thinking through a topic. We know from research on academic language and English language development that providing opportunities for students to articulate their thinking—in a variety of productive modes—is essential (Abedi & Herman, 2010; Abedi, 2010). This practice also makes it more likely that all students will feel included in classroom conversations (Zwiers, 2007a, 2007b). Because bouncing strategically supports making valid inferences and sound instructional decisions, make it your mission to know why you're bouncing as you do. Bounce with intention and awareness. Don't let your moves reflect only happenstance or old habits you picked up from "doing school" (Lortie, 1975). Try "bouncing yourself" through the classroom to listen to at least half of your students as they pair-share in a group work activity. Try just listening—not coaching. Try getting to every area of your classroom, especially those hard to reach pockets. Listening can be a good way to sample vulnerable or shy students' talk without shining the spotlight on them (yet). Try bouncing by snaking (turn-taking "snakes" through the seating arrangement), whipping (student responses "whip" around the room), or popcorning (students decide when to speak, so responses can "pop" from anywhere). Experiment with the upsides and downsides of each method for various poses and probes and the kinds of sampling you want to achieve. Does the unit get harder at a particular point? Are there well-documented p-prims, preconceptions, and misconceptions in this topic? How can you quickly spot check who is struggling with the big idea or discrete procedure? Which sampling strategies make the most sense at which turns of the lesson? In the complex world of bouncing moves, we are listening for and trying to capture the maximum number of responses to widen the student response sample size. Like we found with pausing, a main purpose of bouncing is to increase the sample of responses for any given question or task. By bouncing systematically, we increase the likelihood that more students can and will add their voice to the classroom. Let's go back to our pausing example from Chapter 3. We imagined we had 36 students. We said that on a typical day, Devi, Christy, and Alex will respond within a fraction of a second and raise their hands, which led to 3 responses out of 36 possible student responses. We noted that in this scenario only 1 out of 12 students in the classroom respond. Of those three responses, two were correct and one was a misconception. The problem is (and yes, there are many problems in this scenario) we still don't know how many other students shared that misconception. More than half? Less than half? Was it precisely that misconception? Or slightly different? If this is too complicated, then let's simplify. A little technology should help. We hear the teacher say: "Okay everyone, please use your clickers now. Vote if you agree with (A) Devi's solution, or (B) Christy's, or (C) Alex's. I see from the results on my computer that several of you still haven't voted. I'll wait. Okay, it looks like Devi's solution is the most popular." In the best of all worlds, the kids can self-diagnose accurately, they do not guess, and they can explain why they voted for Devi on a principle other than she always gets it right. It turns out Devi had the misconception this time (she confused the word materials with surface area and volume). But the students who voted for her solution may or may not have shared her misconception. They may know that she usually gets things right and has an A+ in the class. Technology can mask bouncing problems as much as reveal them. For a low-tech option, what if the teacher had three coffee cups and she polled the kids instead? After asking Devi, Christy, and Alex to explain their reasoning at the document camera (if a visual is necessary) and assigning a coffee cup to each answer, the other students are asked to drop their popsicle sticks (identified with their names) in the cup that corresponds with their answer. Based on the results, the teacher pulls a stick and asks a randomly chosen student to explain his or her reasoning and how it supports the solution. Not only has the response rate improved by bouncing more systematically, but the students now have the opportunity to elaborate on each solution and explore its strengths and weaknesses, which can help them to meet Standard 3 of the Eight Standards for Mathematical Practice, "Construct viable arguments and critique the reasoning of others." (CCSSI, 2010). Address the use of academic language and the practicing of particular registers of mathematical/specialized subject matter discourse, which are learning targets and criteria for success. Take the advice of experts on the need for wait and think time. Connect to the real world and standards by inviting students to collaborate, discuss, and weigh options to solve problems. Help create classroom learning environments that support equity and inclusion, but also demand engagement with high-order skills from more than the eager students while still sharing the floor with them. We invite you to think about how improving bouncing often takes adjusting not just our practices, but our beliefs as well. Fortunately, trying out new practices can help us to examine beliefs—and test them against experience. Trying new bouncing practices might challenge and dislodge unhelpful and potentially harmful beliefs: The shy ones don't want to speak. This one doesn't know the answer and always gets it wrong. That one didn't do the homework and always falls behind. These kids are too lazy to share or when they do, I can barely hear what they are saying. Rather than overgeneralize and play to your worst fears, try on a new bouncing practice, reflect with your students on its worth, tweak the procedure as needed, and rededicate the class to having everyone participate. Tell them what's bothering you about pouncing. Show a picture of Tigger (not Professor Kingsfield). Ask your students "What is to be done?" We predict you'll be pleasantly surprised at what you and your class discover together. Some of your students will be delighted to be included in the FA-driven classroom where dialogue is at a premium and bouncing is prolific and productive. Others, not so much. You will get through the unease, however—together. Remind your students: no pain, no gain. Bouncing is like pumping iron. Feel the burn. Celebrate victories among the inevitable setbacks with your students. Ask them to reflect on specific bouncing practices that are working well for them. Remind them that as they get better and better at bouncing, they are growing up and getting ready to go out on their own. Make connections to the worlds of work, college, and life. Doctors bounce medical opinions to their colleagues. Construction workers bounce ideas off structural engineers. Retail sales people bounce different products and services to their customers, explaining the benefits and costs. In society, we need to hear from everyone to make good decisions. Bouncing helps to create feedback so people can be heard. Our democracy may depend on our citizens being able to discern the difference between pouncing and bouncing. What time is it? It's time to persevere, to try new social skills, to speak up and listen better. It is the 21st century and global communication skills and capacities are at a premium. Try making your learning community's stance toward bouncing explicit, intentional, and public. Show how bouncing is connected to all sorts of exchanges and that to be players in a democracy and the global economy we have to step up. Post positive statements of these values and beliefs around the classroom. We all need reminders. Colorful images can support class agreements. Here are some sample class agreements about bouncing. We check: Did everyone have a "say" today? Who's next? Orchestrating bouncing moves in your classroom can feel like directing traffic, hosting a dinner party, mediating a conflict, and navigating a maze—all at once. Having sentence starters ready for a variety of bouncing routines can help you be present for teachable moments. Planning for bouncing means you can put your cognitive powers (attention, memory, effort to encode and retrieve information) on other moves such as probing or tagging when you need them most. Ultimately, your attention needs to be on making sense (what we call Binning in Chapter 7) of student responses. But before you can start tallying, noting reactions, making connections, inferring patterns, and improvising your own responses to student responses, you need ways to quickly increase the sample size. As your teacher/mentor, I really need to know what you all are thinking in this unit. If you don't understand or aren't sure, I need to hear your voice so we can improve. How will I know you're ready to share when things get tough or we get stuck? Can you give me a signal? Should we "check in" at the end of each week? Thank you for all your effort and contributions this week. Your enthusiasm is wonderful. Let's see if we can get others to be this enthusiastic next week. Who hasn't had a lot to say yet? What can we do as a class to help you share your ideas more next class? Before I select someone to answer, I'm going to give everyone more time to think. For this challenge problem, we're going to hear from everyone. I want to hear from someone in this part of the room now. Let's hear from someone who hasn't spoken yet today. There's probably a range of opinions on this. We can find out by checking in. To do that, first we'll _______________. Who is thinking something different? I'm not sure what is meant by ___________. What are some other possible ideas? Let's have some folks add to that. This could be a good question for the class. Let's get the whole class in on it. Got an eager beaver? Talkative or easily bored student? Assign her as scribe (more on this in the next chapter on Tagging). We say take students' energy and passion and harness it. Differentiate with subtasks that engage the students who tend to talk a lot. Focus your energy on bouncing to those students who are not yet in the habit of speaking up and still outside the response space. Widen the loop as you reposition those who have already added to the discussion. Enlist the eager beavers into the process of expanding the discussion outward. How could you be bouncing differently to get better, more robust classroom data? A good place to start is by collecting all the soft data available in each lesson. Focusing on this treasure trove of observations (from daily word webs to exit tickets) will help you answer this question. Are your "go-to" bouncing routines yielding what you'd like them to yield? How do you know if you can trust the evidence? Is your memory of the student responses from the popcorn exercise that good? Without running records of the streams of soft data to examine, review, and look over, how can you determine to what extent a bouncing routine is working to uncover student thinking and increase your understanding of where the kids are today, yesterday, and the day before? Before we go further, keep in mind that bouncing will look different depending on your reason for bouncing. Bouncing to check that students understand instructions is one thing. Bouncing to uncover prior knowledge on the concept of ratio or thesis is another. When reflecting on a choice of sampling strategies to capture the soft data, it may also help to note the differing contexts and purposes for bouncing based on research. Bouncing at a particular juncture in a well-established learning progression may require a different approach than for the more generic levels on a taxonomy. Again, it all comes down to the cognition vertex and the path a formative assessor takes to respect and honor important learning targets that form part of the assessment triangle. For bouncing, I often use equity sticks. For each class, I've got a cup of wooden tongue depressor sticks, one with each student's name. Using equity sticks helps me—helps us—hear from students who, given a choice, won't volunteer. I'm a big believer in Students need to talk to learn, and A teacher's job is to help students listen to, respond to, and learn from their classmates' ideas. It's important that the ways we bounce help me to sample, probe, and get students talking with one another and with me. The students can't see it, but I put small color-coded dots on one end of the sticks: yellow for English language learners, light green for students with IEPs, orange for so-called "middle achievers" with no diagnosed learning issues, and light blue for students who consistently give strong responses no matter the topic. Of course there's overlap. I've got English learners who are really strong in math, and so on. Still, the dots remind me that to get a good read on where a class period's understanding is, I need to sample from all kinds of students. The coding helps me be strategic, purposeful, and systematic in my bouncing. There's another benefit to using equity sticks (the physical, actual sticks versus an anonymous, hand-held randomizer app on my smartphone): the sticks support a good visible routine, which is pose, pause, pull a stick from the cup, and probe. I've used index cards, too. I like when the students see what I am up to. When I open a lesson or make a transition to an activity, often I pose the question, protect silent think time, and have everyone pair-share. Then I shake the cup of sticks. The noise grabs their attention and says, wordlessly, "Come on back from your pair-share, we're about to hear from several of you." I find the physical presence of the sticks does this better than any app. Whenever I can signal, lead transitions, and reinforce norms without talking, I do. I use my air time judiciously. When I'm pulling equity sticks or cards, there's always the option to pass. (I don't really like the "volun-tolds" cold-call game.) But students don't often pass. I think it's because our class is a safe place for tentative or "trial balloon answers" as we call them. As a math teacher, I focus on how students have arrived at an answer, not just what the answer is. I bounce to hear explanations [of their thinking]. They know that. It's how we do math class together. I make a point to affirm and build on students' contributions. My kids see that. What they say gets used in class, respectfully. I think this also plays a role in the "pass" option getting exercised less often than it otherwise might. I probe too. When equity sticks are part of bouncing, I'm careful about probing since the fact that I'm using equity sticks means I can't know whether the student in the spotlight would have volunteered. This matters. In general, I think that students who have volunteered to respond are more at ease with public probing than students who have not volunteered to respond. But it's hard, maybe impossible, to know for sure. I bounce differently for different purposes. I use the equity sticks when that kind of entirely random or partially random selection (when I use the color coding) makes sense. My decision often depends on where we are in a lesson. Sometimes I decide ahead of time which students I'm going to call on and in what order—for example, when I'm having students come up to the document camera or dry erase board to demonstrate how they solved or approached a problem. In these cases, I've already gone around the room as students were working. I know who has solved the problem and how. It wouldn't make sense for me, and wouldn't match my purposes for the students' learning, to pull names at random. Since I've already sampled student thinking, how I bounce at this point in the lesson is more for the students' benefit, not my own. I want all the students to see the different ways the problem has been approached and for us to begin to make sense of this together. As students demonstrate and we discuss, I count on all the other FA moves to help us. We usually build from more common, concrete operational solution methods to more abstract or uncommon solution methods. My 6th graders are transitioning from arithmetic to algebraic thinking. How I bounce in this part of the lesson is supposed to serve all my students in interacting with and being able to link these different ways of thinking about and solving math problems. Whether the students are passing the class dolphin, or I am using the sticks in a cup—the larger point is the same and my students know the routines by now. We all get sampled for our ideas, solutions, and strategies. Making sense of mathematics as a class is as important as individual growth and progress. Prioritize your bouncing moves—one routine at a time. Your professional goals are your own. You know best where and how you could best spend your energy for next steps. New teachers in particular do well to focus on bouncing effectively regarding students' understanding of content. This helps them build their pedagogical content knowledge (PCK). PCK is specialized knowledge experienced teachers have for their subject matter and the knowledge and skills they have in relating content to their students' learning (Shulman, 1986, 1987). PCK is not only a thorough understanding of a subject's fundamental principles, but also an understanding of the kinds of difficulties students might encounter, and having the creativity to address these difficulties in ways that deepen student learning. The better new teachers bounce, we contend, the faster they can build PCK. This book reminds us again and again that there are no shortcuts to uncovering and supporting student learning. A focus on mastering FA moves and integrating them with PCK can make a big difference. Got bouncing problems in a humanities curriculum? Make it a social issue inside your educational world. Use your classroom to illustrate the significance of the "silent majority" for societies and governments. Look up at the Habits of Minds poster on the wall. Point to Connections and Conjecture. Re-pose: What happens to a society when only a few speak? Who decides for all when only a few go to the microphone? What kind of governments come to power by drowning out the voices of the people? Maybe it's time for a pair-share and quick write: what is the connection between how we behave in school and the kind of government and society we can expect to live in? Or an exit slip: are we training to be powerless in this classroom so we can train ourselves how to be "good" citizens for others? Address the challenge of silence, apathy, and disinterest—no matter which subject you teach. The students are waiting on the adults to get real. Bouncing ideas, exchanging opinions, and exploring student thinking are core principles of the FA moves framework. In a society increasingly unable to engage with people from the other side of the fence, we need to recommit to the values and norms of formative assessment for our children. Take a moment and examine your own beliefs and attitudes toward bouncing. Is it natural and normal for you? Is it awkward and strange for you? Are you a Tigger who loves to pounce on Pooh? Were you a silent Sally or Bob in your school? Which classes made you want to be an eager beaver and which ones made you slink to your seat and hide in the back while hoping to be saved by the bell? We have offered suggestions for smart bouncing, but you and your colleagues are in the best position to come up with and customize bouncing practices for your context. What works in the art classroom or on the dance floor may not work in a science lab or mathematics class (Mewborn & Tyminski, 2006). You're familiar now with the principles behind bouncing and how sampling strategies relate to the logic of assessment design. As you innovate bouncing procedures with your colleagues, we encourage you to widen the circles involved and help one another learn from the range of suggestions and ideas bouncing back and forth among you. A lot of teaching assumes that revoicing what students say in the classroom provides a bounce to the discussion. By amplifying student voices, the teacher is trying to increase the confidence and effects of individual responses to a question. Like an echo chamber, what a student just said gets bounced by the teacher—and perhaps added to and amplified—for everyone to hear. Revoicing is good practice, but we wish to distinguish it from sampling strategies aimed at gathering more and better student data on the fly. Bouncing moves (and tagging moves, which we discuss in the next chapter) look to improve the representation of classroom responses, so as to identify more patterns in how students are approaching the material. Bouncing puts a premium on increasing the sample while including a representative range of student thinking—not merely restating what this or that student said about a topic. How are bouncing and revoicing related? Bouncing is not revoicing, but a teacher can choose to revoice what a student says while bouncing. Researchers O'Connor and Michaels (1993) drew on Goffman (1974) and his concept of animation to identify a strategy they named revoicing. Revoicing is when a teacher gives students an "expanded voice" by saying out loud to everyone what the student has said. In the process of bouncing, it may help to animate and amplify students' voices, but we need to move the ball around the court regardless. To give everyone an opportunity to participate, I announce to the class that I want to hear from those students who have not yet spoken. What follows is that the eager beavers stay quiet and eventually a quiet student speaks up. This procedure, however, does not work in every class. It may work for my seniors who are AP students and do all of their classwork, readings, and homework, but not with my 7th period sophomores for whom school is not one of their top priorities in life. They just don't seem as motivated as the others. Let's unpack the word "motivated" for a moment. Do we mean "motivated students"? "Motivated teachers"? Both? What is motivation, anyway? And what "causes" motivation? In other words, where does motivation come from, for whom? Part of the misconception about effective bouncing depending on high levels of motivation is due to an unexamined assumption. Beginning teachers see differences in their students' willingness to share publicly. They ascribe these differences, often without being fully aware of it, to personality types and noncognitive indicators. Beginners are keenly attuned to what experts call "grit," "locus of control," and "self-concept" in the students they are called to teach. In these teaching placements and internships, our candidates don't perceive lots of examples of perseverance or positive academic mindset. The teacher candidates become frustrated when their students' affective dispositions and noncognitive orientations seem to get in the way of their best efforts. What these new teachers do not see (yet) is that these behavioral differences are more often the result of conditioning than intrinsic qualities of kids. The students, in many cases, are mirroring the behaviors, norms, and attitudes of the school system itself. They feel "batch processed" and they act that way toward their managers. Different ways of "doing school," it turns out, are also related to different tracks in the curriculum. The AP seniors are on track for college and they are operating from a different frame of reference. Hence, they may react to different behavioral cues and signals than those "for whom school is not a top priority." Differences in age and maturity must also play a role in the "motivation" to participate in bouncing moves. Naturally, even "the same" bouncing procedures will unfold differently when used in different classes and contexts. Experienced teachers often meet this reality with a "can-do" orientation, without subscribing to the misconception that "bouncing only works for the motivated." A reason for this is that experienced teachers are accomplished at adjusting and repositioning a practice. They tweak off-the-shelf "solutions" and avoid one-size-fits-all strategies for their particular students. Have not seen a bouncing move work with their particular students. Have unrealistic expectations that a new procedure should meet success immediately for all under differing conditions. Have not yet acquired skills in how to set their students up for success by instantiating and adapting new practices to changing circumstances. Have limited notions of what bouncing is and how it relates to their own perceptions of student traits and dispositions. Have difficulty seeing the general challenges associated with sampling student responses (e.g., restriction of range, measurement error, reliability, and bias). We never shame or blame novice formative assessors for these beliefs or preconceptions. It is, so to speak, their current level of understanding formative assessment. Nor do we pretend that a teacher who rises to the top of a learning progression will never fall back on old habits or have difficulty maintaining a particular level of sophistication with a move. As contexts, kids, and the curriculum change, we can expect the formative assessor to change, too. Rather than look down on the beginner and celebrate how much further along we are as experienced teachers, let's open up new avenues and vistas for seeing the problem of bouncing from the new lens of sampling strategy and design. To address these and many other common p-prims, it's time to go back to the drawing board. All formative assessment-rich classrooms need procedures and practices to widen the net of participation so we can better understand all students' beliefs, opinions, and ideas. Let he who is free of pouncing cast the first stone. Although bouncing is the ideal, we are all guilty of pouncing. Taking this class has made me aware that we need to be prepared with a set of questions to lead classroom discussions, and to call on students as equally as possible, instead of allowing the same 3 or 4 students to respond to the questions. This is sometimes difficult to handle, especially if you want to move on to the next step on your lesson plan; it is always easier to have the same students respond to your questions in order to move on. We know this student teacher and many others like him well enough to realize he cares deeply about students who are at risk. He is a first-generation college student interning at a high-needs school. He, too, felt ignored by and invisible to his instructors. He has a commitment to social justice but knows that pouncing works for now. Classroom management is central at this juncture in his development; formative assessment less so. Perhaps next week's unit presents a fresh start. Let's try to generate a loop with a solid opening question. Ask the kids which method they'd prefer: stuffed monkey, "equity" sticks, or popcorning. We get it. So what does it take for you to persevere with bouncing when you lose motivation? Does blaming the victim of pouncing seem fair? What's the deeper issue here? Remember when we modeled using sentence starters in class. What if you primed for bouncing first? Maybe start by asking the eager beavers to take the lead, ask for volunteers and scribe? Let's make a plan. First, a list. Which actions in the classroom propel you toward feeling more confidence with bouncing? Second, let's observe the kids in another learning space: in the gym, in the science lab, or in band practice. Can these same students bounce a ball on the court? Or share ideas with an experiment? Or play in a band after school? What might it take for them to do the same in your classroom? Bouncing happens everywhere. Your students know how to use social media (Twitter, Instagram, YouTube) to bounce all sorts of things. It's just a matter of making it happen in your world—with them—one day at a time. Priming for bouncing is not easy with a bevy of students used to hearing the few and ignoring the many. Students know from years of experience that teachers are in the habit of pouncing on the first hand up in the classroom. The majority of students are in the habit of letting the minority of eager beavers "do school" for them. Yes, posing "the right question, the right way" matters and implementing a "no hands" policy may work in the short run (Wiliam, 2014). But we need to push more on the meaning of bouncing moves and go a little deeper with research. The truth is we still don't know that much about breaking the chain of a few students providing cover for the many. We ask the formative assessment experts and educational researchers: Who will undo all the years of conditioning that shuts down the feedback loops in our classroom before the bell rings? How can a group of disenfranchised people socialized to shut up suddenly open up? How is the educational system designed to reinforce rather than reset the dynamics of tracking and delivering "just enough" freedom to some so they (or their parents) can speak out and move up? Why should children trust a teacher enough to speak up, and why should they believe that adults are actually interested in what they have to say when they finally feel able to speak? These are tough questions. We do not pose them to mystify or shirk our responsibilities. But let's be clear which habits we are inviting and which ones we are undoing. The FA moves framework is a beginning. It can clarify our stance, but school structures and priorities must support rather than impede the democratizing stance inherent in the FA moves framework. Just as we introduced the posing moves in Chapter 2 that help you to focus on learning goals, curriculum targets, and the stuff that is worth knowing about your subject, we now need to introduce bouncing moves that any beginning formative assessor can try while acknowledging that they may fail to widen the circle of inquiry beyond. For now. Posing and probing moves in your classroom are useless if no one takes the ball to bounce ideas, solutions, first draft responses, and runs with them. Those students who sit there quietly in their seats—the silent Bobs and Sallies—are harder to reach than the FA experts imagine. Is this a Goldilocks quest where we hope for the "just right amount of participation"? Can we really strike a balance and achieve the golden mean where all students, including those at each extreme and in the middle, can play a role in sharing their thoughts? Are bouncing moves just another flight of fancy whipped up by the academics and corps of professional development specialists? Maybe "bouncing" is just the latest flavor of the month in the endless cycle of "reforms" (Cuban, 1990) that are abandoned once the new one arrives? Time will tell. For now, we note that there is so much attention on the outliers in these discussions about how to best engineer exchanges. Yes, we know a vibrant, thoughtful, rich exchange among teachers and students, students and students, even administrators and students when we see them. We have a few examples, mostly from STEM subjects, of classroom formative assessment in action (Ball, 1993; Furtak, Ruiz-Primo, Shemwell, Ayala, Brandon, Shavelson, & Yin, 2008; Franke & Kazemi, 2001; Hammer, 1997; Lampert, 2003; Warren, Ballenger, Ogonowski, Rosebery, & Hudicourt-Barnes, 2001; Warren & Rosebery, 1995). But many of these bounce-rich exemplars are taken from the elementary and middle school years with less attention on how sampling across a wide range of students occurs in the high school classroom. The fact is we don't know very much about the middle range students who have learned to play the game of doing school. The majority of our students, who are neither eager nor silent, just slip through the cracks. Educational reformer Ted Sizer (1984) referred to this phenomena in Horace's Compromise, a book that describes classrooms and schools dedicated to the path of least resistance, where teachers (and students) complacently accept the fact that learning is about learning to do school. Sizer and his colleagues at the Coalition of Essential Schools challenged us to care about the forgotten middle. One way to take up this challenge is to rethink how we assess—for whose good, for what good. The trick is not to become cynical about reaching more students or to fall back on being a summative assessor to catch those who don't play your game. If putting a pedagogical bounce into your teaching practice is too much to ask, then we should not be surprised when Jenny and Raymond tune out, get kicked out, and eventually drop out. For those of us formative assessors who want our students to get excited about learning, and know we can assess better, it is time to increase the sample size and raise the volume on those hard to hear voices. Our teacher candidates are steeped in the basics. They know the tricks of the trade when it comes to describing classroom learning environments that are inclusive and equitable. By the time they get to our course, they've heard of equity sticks in methods courses. They have learned about popcorning, snaking, and other strategies for increasing participation in their multicultural, language literacy, and educational psychology courses. A few of our advanced candidates have tried these tactics in their teaching placements. A few are "in the zone" with the sticks, the cards, and marked-up seating charts. We get to hear their war stories and their personal variations on the bouncing theme. But others sit quietly next to these budding formative assessors and are not so convinced. By the end of the credential program, having run the gauntlet of preparation courses, a few student teachers feel safe enough with (or exhausted by) their university professors to push back. "Hold on, I am not so sure about what you are calling bouncing. It hasn't worked for me. My mentor doesn't do it. What's the evidence it really works?" At this point in the classroom evaluation and assessment course, we know things are working because push back is a form of engagement. The Habits of Mind are in gear. Our beginning teachers are moving up Bloom's Taxonomy. It's one thing to know a fact or procedure related to instructional methods. It's quite another to apply those methods to different classroom contexts, curriculum, and kids. 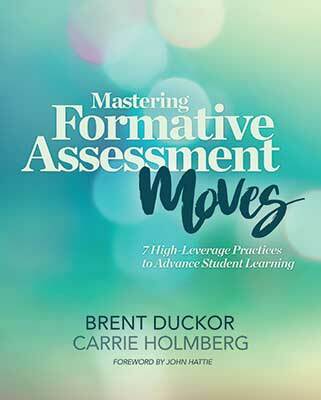 And it is quite another thing to begin to think strategically about which formative assessment moves to experiment with and for which students—and to think about when things fail, why and what can be done next time. By now it should be clear that the purpose of reflecting on the just-taught lesson is to "re-experience" and rethink what is actually addressable and actionable. Using the FA moves framework, we can guide your attention to what matters for the teacher learning to become a formative assessor. We present the concept of sampling strategies under the umbrella of bouncing moves. It gives us all, as Pamela Grossman calls it, a "grammar of practice" to share and play with as teacher educators (Grossman & McDonald, 2008). Before moving forward, let's breathe. To be clear: sampling student thinking is not easy. It requires making difficult instructional decisions. There are trade-offs and compromises with listening to some, but not others. Not everyone can or must be heard at every moment of the lesson. We hear our beginning teachers. Growing pains in this profession are real. Being purposeful and skeptical is critical to gaining traction on any learning trajectory—for teachers, too. In the parlance of educational psychologists, a few of our student teachers are moving beyond declarative knowledge about what sampling means and procedural knowledge of how to use equity sticks effectively; they are also applying schematic knowledge of the entire FA moves framework and strategic knowledge in deciding which strategies are likely to work depending on the context, student needs, and curricular demands. These teacher candidates are moving through the formative assessment realm, making connections, and seeing how it is all related back to the bigger picture. Once you have some traction in a discipline, it's good to ask: "Wait a minute. Why should I use a quick write during my science lab when I can use that activity to warm up the concept of 'diffusion' at the beginning of the lesson, and circle back at the end of the period with an exit slip?" In the past I have had trouble trying to include bouncing in my lessons. Unless I am actively thinking about it in the moment or put it into my lesson plan, I tend to forget. Lately I have been experimenting with using a plush toy as a means of getting my less willing students to talk. I toss the toy to one student who speaks and then throws it to another student, and so on. So far it is working nicely with my freshman class, who tend to be very vocal and all want to share at once. It's adding more structure to the discussions, and students are now becoming more respectful of their peers. The discussions have become much more student-centered and less teacher-centered, and I am happy to see that they are beginning to feel comfortable posing their own deeper questions for the rest of the class to answer. It's also serving to bring out answers from my ever-so-quiet girls. Both of my classes have a majority of boys, and the boys tend to drown out the girls. The plush toy is forcing the girls to give an answer, and to speak loudly and clearly, forcing the boys to listen to what they have to say. I hope that this succeeds in building confidence in the girls in my class, as well as helping the boys be more patient with responses and response times. Maria has taken the bouncing challenge. She is playing with a sampling method that we discussed earlier in this chapter. Though Maria probably doesn't describe it this way to her mentor teacher, what stands out for us as her university teachers is her sense of the need for equity. Bouncing moves are no longer an academic abstraction; Maria can actively use sampling techniques to address the need for a plurality of student responses. In a diverse public school classroom, we can expect different students will feel empowered to speak. Others will hang back and watch the action. What is to be done: get out the tin buckets, coffee cups, plush toys, or stuffed monkey. It's time to put a bounce back in our steps and move a little closer toward the goal. Teachers like Maria who are aiming to master formative assessment moves will design a sampling strategy to widen the net. They may focus on gender identification or language or ability groupings for a particular class period to balance participation. They might tackle sampling challenges around specific learning targets (such as students' reading, writing, oral communication skills) with their colleagues. Or, they might consult with school counselors, paraprofessional staff, and after-school providers about students who seem stuck and unable to bounce, and ask what seems to work best for these kids. In department meetings and professional learning communities, these formative assessors are not content to play grading games. They fight for the time, resources, and attention needed to advance student learning. This means standing up for assessment practices that uncover more student voices and help us to get a better, more reliable picture of student thinking during instruction. These classroom assessors are united in a struggle for making learning visible, in part, by resisting technologies that hide that learning or merely box it up into tidy, neat packages. By focusing on the interpretation vertex of the assessment triangle and starting to see the importance of having a classroom sampling strategy, Maria is thinking more and more like an action researcher who is studying what works and what doesn't to widen the net. She is acknowledging the limits of her evidence and looking for a firmer basis to develop instructional next steps. We want all teachers to gain a more representative, balanced view of their students' thinking—to move beyond chalk and talk, question and answer, and pouncing routines that skew what teachers know and can do with soft data. To do that, we have to adopt Maria's stance toward her own pedagogical practice. We could, of course, inquire into the buckets or cups that Maria chose to use this semester in Phase II student teaching. As part of lesson debriefing we might ask her and her mentor teacher about the equity sticks: Are you ready to explore other buckets (e.g., ELL, Latino, kinesthetic learners) to hold these sticks? Are there any connections between these students? Do their learning styles and issues overlap? How do we ensure that all students feel safe and no one feels singled out when you pull the sticks and cards? Knowing that Maria is at a particular level of pedagogical development with her bouncing practices allows us to better serve as guides on the side. We do not need to dominate the conversation during her reflection on the lesson. Nor do we see it as productive to demand she bounce to this or that student, in this or that group, with this or that designation or label. Rather, we see her bouncing moves on a continuum of professional growth, and we note her progress with breaking down the sampling, looking at ways to widen the student response space, and connecting her concerns for social justice and equity to her teaching practice (Guitérrez & Rogoff, 2003; Noguera, 2008). Like many of our credential candidates, Maria has learned that part of becoming a formative assessor is changing up our game and the familiar routines we take for granted. She is experimenting with configurations and groupings of FA moves to see if she can learn more about her students' thinking. She wrote at the end of the semester: "I am hoping that by bouncing in this way, the girls in the class will be able to find their voices easier, and that our discussion will also become much more student centered. We'll see how it goes!" That sense of hopeful expectation and the attempt to shift to a student-centered pedagogy is a big step in her teaching career. The utterance "we will see how it goes" is what we formative assessors live for. As we've just highlighted, deep bouncing moves are intertwined with other moves. It's complex and often quick paced. We can make a move, start dancing, then trip and fall before the music is over. Falling down is inevitable. Getting up is the real challenge. As teacher educators, we want beginning teachers to learn. This means, as Piaget and others remind us, we can expect teachers who are learning a new craft, skill, or concept to go through a process of assimilation and accommodation. The constructivist approach to learning recognizes the need to move beyond concepts such as assessment for learning with novices and to start building scaffolds and supports toward deeper pedagogical practice. Experience is key. So is patient coaching. We'd like to know those teachers learning formative assessment moves are trying out new ideas, making mistakes, and reengaging bouncing moves through practice. Only by applying what they have learned in their efforts to get better at sampling student thinking—and knowing that they are supported by mentors when things go awry—can teachers improve in the domain of formative assessment. To build up a mental model (new schema) for bouncing, those learning to become formative assessors need time, experience, and guided practice. That's how all people learn. The real challenge for anyone seeking to master formative assessment moves is to develop a mental model or schema for sampling and widening the student response space. Bouncing is a placeholder we use to build up new connections in this FA domain for beginners. If there is going to be a deep shift in classroom assessment practices, we need a new language to describe these new practices as we slowly replace the old ones. But on our journey we shouldn't get lost in the narrow pursuit of technique to the point that we leave the road to broader understanding. Bouncing presents more to think about than meets the eye. The following questions, prompts, and tasks can help you broaden and deepen your bouncing. Remember the point is to examine your sampling strategies for gathering student responses (oral or written). The following questions, prompts, and tasks are designed to help you advance your bouncing skills and take the ideas and thoughts in this chapter a few more steps forward. You can use the prompts in Warm-Up Prompts as self-checks and ideas in Try-Now Tasks as conversation starters and exercises for independent study or group work. What are the consequences of skipping over the priming-for-bouncing phase of formative assessment? Who seems to thrive on pouncing vs. bouncing in your classroom? Who does not? What are some ways to accommodate these differing participation styles productively? What bouncing agreements have to be in place in your classroom to maximize the number of student participants? What is your personal goal for the number or percentage of student responses? How can you monitor that goal? On the first day of a new unit, jump right in to this activity with no lead-in or fanfare. Write the word bouncing in the middle of the board. Ask, "What comes to mind?" In 30 seconds or less, write down all responses on the board. On the second day, explain to students that it's time for a word web. Remind them that word webs are warm-up tasks that help us to start thinking about a topic. Put the word bouncing in the middle of the board. Ask your students to write on a sticky note what bouncing brings to mind and then to place their responses on the board (can use other media, if preferred). Take approximately 2 minutes. On the first day of the next week, pair students up to discuss their responses before writing to the prompt "We bounce because …" Have a student from each group state one reason/agreement. Appoint a scribe to capture these reasons/agreements on the board, poster paper, or shared software such as Google Doc. Give up to 5 minutes. Give an example of a bouncing move you made this week. What worked? What didn't work so well? For whom? List 1 or 2 next steps to better prime for bouncing. Are bouncing and pouncing compatible? Discuss. Challenge task: Have one person in the group explain why a particular procedure may support more effective priming for bouncing in the classroom. Allow another person to "push back" and say why these moves may not work—for whom and why it matters? Pick a focus "student" and use a fishbowl approach to discuss the challenges and ways to work on them. Copyright © 2017 by ASCD. All rights reserved. No part of this publication—including the drawings, graphs, illustrations, or chapters, except for brief quotations in critical reviews or articles—may be reproduced or transmitted in any form or by any means, electronic or mechanical, including photocopy, recording, or any information storage and retrieval system, without permission from ASCD.